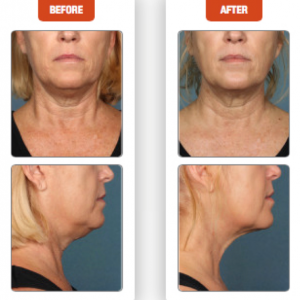 Are you looking to remove fat below the chin without undergoing surgery? We recommend inquiring about our treatment with Kybella™ – Contouring Redefined. Until recently, the only option for achieving a more chiseled chin appearance was plastic surgery. However, now there is a new injectable solution called Kybella™ (deoxycholic acid.) 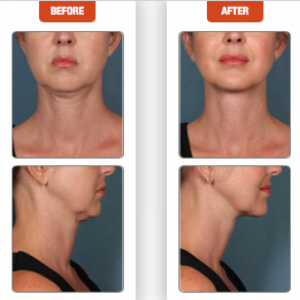 Kybella is an FDA-approved treatment to help remove moderate-to-severe fat below the chin, known as submental fat. Kybella works by destroying fat cells, where injected into the chin area, decreasing the appearance of the fat that hangs below the chin, sometimes called a double-chin. Kybella is deoxycholic acid, a fat-absorbing substance found in our bodies naturally. The deoxycholic acid produced in the body helps the body absorb fats. Kybella is a cytolytic drug, which when injected into tissue physically destroys the cell membrane and it destroys the fat cells under the chin, leaving the skin substantially tighter and the jaw more contoured. When properly injected into submental fat, the drug destroys the fat cells; however, it can also destroy other types of cells, such as skin cells, if it is inadvertently injected into the skin. It is, therefore, important to have a trained, licensed physician conduct the procedure. 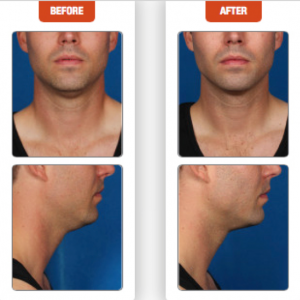 More than 20 studies with thousands of patients have shown that almost 70 percent noted both physical and emotional improvement after treatment with Kybella. FDA approval was established based on two clinical trials of 1,022 adult participants with moderate or severe submental fat. Participants were randomly assigned to receive Kybella or a placebo for up to six treatments. The results conclusively showed that reductions in submental fat were observed more frequently in participants who received Kybella versus the placebo. For best results it is recommended that patients commit to 2 to 6 treatments spaced a month apart with 12 to 20 injections per visit; though some patients may need up to 50 injections in a single treatment. Up to 50 injections may sound like a lot of injections, but the treatment typically takes less time than a basic manicure – around 20 – 30 minutes. Using Kybella for treatment on areas other than the double chin is not FDA approved or recommended. For more information about Kybella or to schedule a consultation, call Dr. Taylor’s Cape Coral office at 239-540-9918 or her Fort Lauderdale office at 954-290-4053 to be scheduled for a consultation today.